He had been a powerfully-built man, which served him well when he spent nearly two decades as a Philadelphia police officer (rising as high as plainclothes detective in the late 1940s). His 1940 World War II draft card lists the then-36-year-old patrolman as 5’10” tall and 210 pounds, dark-complexioned with black hair and brown eyes. But the stroke he suffered at 73 had left the right half of his body paralyzed, making him seem much frailer. Nonetheless, as I stood next to his bed in the rehabilitation center, he had more than enough strength in his massive left hand to grip my smaller 11-year-old hand tightly. As he held my hand, he made me swear to him that I would become either a doctor or a lawyer, the professional pinnacles for late 19th– and early 20th-century Jewish immigrants and their immediate descendants. At that age, I was far more interested in math and history—and not particularly good with blood (I still am not)—so neither option appealed to me. However, I adored my grandfather, so I did as he asked. None of us in that room, in the early fall of 1978, had any idea what “epidemiology” was, but that is the field in which I earned my doctorate 36 years later. Wednesday, December 12, 2018, would have been Samuel Joseph Kohn’s 114th birthday. Here he is, with my grandmother Irene (who he would divorce only a few years later), at his younger daughter Elaine’s 1960 wedding to David Louis Berger. Six years later, the young married couple would adopt a boy and name him Matthew…but that is an entirely different story. However, as I wrote with regard to my paternal grandfather Morris Berger (and his four younger siblings), dates of birth are hard to pin down when official American birth certificates are not available. Decades after the fact, researchers (and curious descendants) are forced to rely on documentation such as naturalization papers, military service documents and United States Census (“Census”) records. But it is not just dates of birth that can be difficult to verify. Things as supposedly straightforward as name and place of birth may prove tricky as well…especially when those facts were deliberately altered to fit in better with an early 20th-century urban American milieu. I do not mean this to sound sinister. It was no secret when I was a boy that sometime between 1930 (when the Census records 25-year-old “Samuel Cohen” living at 1842 N. 32nd Street) and 1934 (when his marriage record to Irene Goldman lists him as “Samuel Kohn”), my grandfather changed the distinctly-Semitic (and distinguished) last name of “Cohen” to “Kohn,” believing it to be more ethnically ambiguous. He had done this, supposedly, anticipating anti-Semitic resistance when he joined the police force (and even when that occurred is a bit of a mystery). When you consider that his father, Joseph Cohen had been, variously, a rabbi, a shochet (Kosher butcher) and a Hebrew school teacher—and that he and his 11 brothers and sisters were purported to be direct descendants of the legendary Shpoler Zaide  (“the Grandfather from Shpola” or, as I knew him as a boy, “the Dancing Rabbi of Shpola”), the surname change is even more striking. It may not have been simply joining the police department, though. Sometime after landing in Philadelphia in 1911, Yaakov Gurmankin of Cherson (in modern-day Ukraine) became “Jack Goldman” of Philadelphia—and his four daughters (of whom Ida—or Irene—was the eldest, born August 11, 1914) became the “Goldman Girls.” Adopting a less “Jewish” sounding name was a fairly common occurrence for these newly-arrived immigrants, a natural part of their slow assimilation. But let us return a moment to his 1940 draft card. It lists his date of birth as December 12, 1904 (so far, so good) and his place of birth as…Cleveland, OH? When I located this draft card via Ancestry.com sometime last year, as I began my family research, I was less surprised by the birth location as I was by how early Samuel Kohn had begun claiming it. In February 2015, “Snowmageddon” shut down Boston’s Logan Airport, forcing me to spend two extra days in the San Francisco area (Burlingame, actually) following the conclusion of that year’s NOIR CITY film festival. As I enjoyed dinner (including a nice chianti) at Café Figaro my first night in Burlingame, I had a long text exchange with my maternal aunt and her children (which, unfortunately, I have since deleted). It was then I learned Samuel Kohn had changed his birthplace from Shpola to Cleveland, adding to his slow Americanization. OK, so how do I know he was born in Shpola? 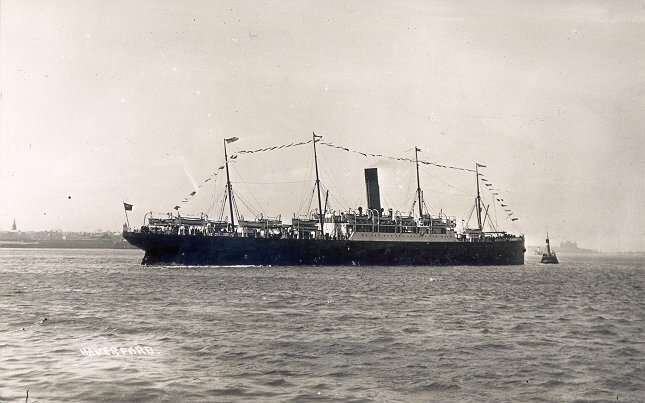 Joseph, Bessie and six or seven of their children were among the 1,091 steerage (I presume) passengers who sailed on the SS Haverford from Liverpool, England on November 18 (or 20), 1912, landing in Philadelphia on December 3, 1912. It was quite a harrowing journey, according to the front page of the December 4, 1912 issue of the Philadelphia Inquirer. I wonder how close my grandfather and his family truly came to perishing in the North Atlantic (only eight months after the sinking of the Titanic), which would have rather dramatically altered my family’s history. Wait, hold on, back up a second. Who the bleepity-frick is “Israel Cohen,” born November 22, 1905? When my mother died in March 2004, I acquired a handful of documents relating to my grandfather. One of them was a small white piece of paper on which was written my grandfather’s Hebrew name as it was supposed to appear on his headstone; I recently came across it digging (again) through the “genealogy” folders in my filing cabinet. Clearly, at some point between December 3, 1912 and January 14, 1920–the date on which the 11-person Cohen household (including 15-year-old “Samuel”) at 729 Morris Street in South Philadelphia was enumerated by A. S. Burstein—”Yisrael (son of Yosef) HaCohen” became “Samuel Joseph Kohn.” I do not know why Rabbi Levin did not put this Hebrew name on the headstone; perhaps he simply could not reconcile “Yisrael” with “Samuel” (whose Hebrew equivalent is Shmuel). As for when a date of birth of “November 22, 1905” became “December 12, 1904,” it is telling that the latter date is more consistent with the ages listed for Samuel Cohen on the 1920 (15) and 1930 (25) Censuses. The former is consistent with a date of birth between January 15, 1904 and January 14, 1905, while the latter (conducted April 4-5, 1930) implies a date of birth between April 6, 1904 and April 5, 1905. The bottom line is this: upon embarking from the SS Haverford onto the Washington Avenue pier 106 years ago (what must the city have looked like to him, his parents and siblings coming from a town that had a population of about 12,000 in 1897? ), a sea-sick Yiddish-speaking seven-year-old boy named Yisrael HaCohen from Shpola, on the rural outskirts of the Russian Empire, slowly transformed into the English-speaking Philadelphia police officer Samuel Joseph Kohn from Cleveland, OH. Why he chose “Cleveland” and moved his date of birth back 11 months and 10 days remains a mystery. In April 1930, Samuel Joseph Kohn was an attendant at a Gulf Refining Station—and probably starting to play pinochle, which would be the great passion of his life. Sometime in the next four years, he met a lovely teenager who lived about five blocks north of his packed house at 1842 N. 32nd Street. He married Ida “Irene” Gurmankin, I mean Goldman, at the Jewish-catering Imperial Hotel in Atlantic City in the summer of 1934. The would have two daughters, including my mother Elaine in January 1938. It was a contentious marriage—two hotheads separated in age by eight or nine years—but he was a great father. Later, he would be a beloved grandfather—and family patriarch. As I have noted, his time on the force remains a large black box, but a handful of articles in the Philadelphia Inquirer and conversations with my aunt (plus this book) tell me he was stationed in at 28th and Oxford (not far from his Strawberry Mansion house) in February 1937, where he was an incidental part of a post-shootout car chase. By 1948, he was a plain-clothes detective working on the Crime Prevention Squad (which targeted juvenile offenders); in November of that year, he and partner Jack Auerbach arrested two brothers at 23rd and Venango for running a numbers bank with a daily take of $1,200. In 1951 and 1952, a patrolman again, he worked in South Philadelphia (7th and Catherine) busting rackets under Acting Staff Sergeant Frank Rizzo (who would serve as a very controversial police chief, then mayor from 1972 to 1980); Rizzo and my grandfather looked very much alike, actually. My aunt told me he always voted Republican (despite living in a family that adored Democrats like Franklin Roosevelt) in those years because he thought his career depended on it. A few years later, he had retired from the force and begun to operate a series of taverns in “seedy neighborhoods” (according to my aunt), at first with his brother-in-law Harry Alterman. I would love to imagine David Goodis frequenting one of those taverns. His father Joseph died in October 1930, followed by his mother Bessie in November 1941. In January 1922, his sister Sophie had died seven days after giving birth to her only child, a daughter named Evelyn; she was only a month away from her 20th birthday (as I put it to my wife Nell, this is when this type of research “gets real.”). His sister Sima died in October 1944. And by 1930, his brother Benjamin had moved to New York City to start a family. This left Samuel the male head of a rapidly growing family that would meet every year (becoming known as the “Cousins Club”) to celebrate the first night of Passover with the ritual Seder meal. (This tradition would continue for decades; as a boy, I looked forward to seeing all of my cousins at the vast Doral Caterers—which closed in 1989—near the intersection of Bustleton and Cottman Avenues, where inevitably one of us would be injured after an evening of high-spirited shenanigans). …and again in 1953 (my 15-year-old mother is in the white blouse, seated on the right edge). Five years after this Seder, in 1958, both his brother Benjamin and his sister Bella died. But on January 17, 1960, he proudly watched his daughter Elaine marry a charming and handsome young man named David Louis Berger. His first (of four) grandchild, Mindy, was born on March 8, 1962. And then I arrived (literally) in September 1966. By 1964, meanwhile, he had divorced his wife of nearly 30 years and moved to Atlantic City, where he drove a jitney for a few years before retiring; I used to spend hours riding them up and down Pacific Avenue for only 35 cents in the summer of 1974 and 1975. It is those summers I remember when I think about my grandfather. By then, he had settled into the Warwick Apartments, just off the beach on Raleigh Avenue; I would occasionally spend a weekend with him there over the winter (I loved it, but let us just say that my grandfather could give Oscar Madison a run for his money). Occasionally, he would take me for a ride on one of the double-decker (we always sat on top in the open air) boats that departed from Captain Starn’s seafood restaurant and sailed lazily south along the beach then north again. He would treat me to an ice cold can of Coke or Dr. Pepper from a vendor with a cooler; they remain the most delicious sodas I have ever tasted. And then there was the night—probably in the summer of 1974—when my mother and I had dinner with him in his apartment. At the start of the meal, I was served a steaming hot bowl of tomato soup (most likely Campbell’s cream of tomato). It was a hot night, so I sat at the table shirtless. Then, somehow, my grandfather tipped the entire bowl of soup onto my bare chest. At this, my grandfather—tough-as-nails Philly cop, tavern owner and Cohen family patriarch—became completely distraught; I have never seen a man look so shattered. And while my chest was still stinging in pain, despite the butter (yes, butter) being rubbed on it, his reaction had me feeling sorrier for him than anything else. Just over four years later, on November 15, 1978, Samuel Joseph Kohn (and Yisrael ben Yosef HaCohen) succumbed to complications from his stroke (“cardio respiratory collapse” from “myocardial infarction”), ending an extraordinary rich life that typified the 20th century immigrant experience. Less than one year later, I wore his yarmulke at my Bar Mitzvah. Despite being a Jewish-raised Atheist (married to an Episcopalian-raised Agnostic), I still wear it (with my father’s tallit) when I light the candles of the menorah on Chanukah. I end where I began, with this excerpt from page iv of my doctoral thesis. This dissertation is dedicated to the memory of three late members of my family whose love and support I miss every day. First is my maternal grandfather, Samuel Kohn. Toward the end of his life, he made me promise that someday I would become either a lawyer or a doctor. Pop-Pop Sam, I kept my promise. In early November 2018, a man reached out to me on Ancestry.com, seeking information about Joseph Cohen. He believes (and there is some decent evidence in support) that his great-grandfather Yankel Cohen—a rabbi from a town just 10 miles south of Shpola called Zlatopol (now part of Novomirogrod), whose younger brother were also rabbis—was my great-grandfather’s older brother. And he alerted to the researches of Dr. Jeffrey Mark Paull, who has traced, through Y-DNA, the male descendants of the Shpoler Zaide. Somewhere in here lies the truth of our descent (or not). Curiously, the date of birth listed on her husband Leib (Louis) Goldstein’s Naturalization Petition is July 10, 1886. Or was it July 4, 1894? This was actually a guess based upon her being born on the third day of Passover in 1908, which she later learned was April 19. The italicized words were handwritten on his Declaration of Intention, dated June 1, 1915. According to the 1930 Census, Sima Cohen arrived in 1914, though that date is almost certainly 1913, when she and her husband Leib arrived in Philadelphia on the SS Breslau. Meanwhile, the 1930 Census says Bella arrived in 1899, though she would only have been eight or nine years old then; I suspect that is a miscommunication. “GUNMEN FLEE POLICE SHOTS IN TWO DUELS,” Philadelphia Inquirer (Philadelphia, PA), February 28, 1937, pg 4; “Brothers Seized On Numbers Count,” Philadelphia Inquirer (Philadelphia, PA), November 27, 1948, pg 15. A little over $12,600 in 2018 dollars.